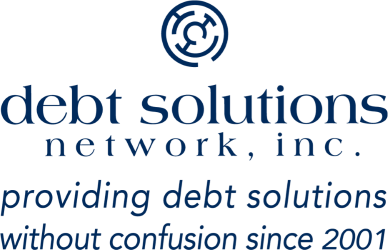 Debt Solutions Network > Debt Management Advice > Debt Advice > What Is The Best Way To Get Out Of Debt? To me the best way to get out of debt is for as little as possible as soon as possible. This question is asked of me quite often given that I’ve worked at Debt Solutions network for almost 10 years now. The answer is, the best way to get out of debt really depends on your situation. There are really only 4 programs to choose from. 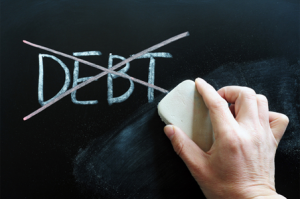 For many the best way to get out of debt is to go through a debt settlement program. The Debt Settlement Program is not right for everyone, but if it’s a good fit for you, it can be wildly successful. The program is designed to eliminate all of your unsecured debts in as little as 6-36 months. Debt Settlement can be particularly successful for people that are on a fixed income, such as Social Security, unemployment, disability or retirement. It is also great for people whose credit cards are maxed out and they’re paying their creditors just to barrow it back again and again, month after month. One of the best things about this program is that you are in control. 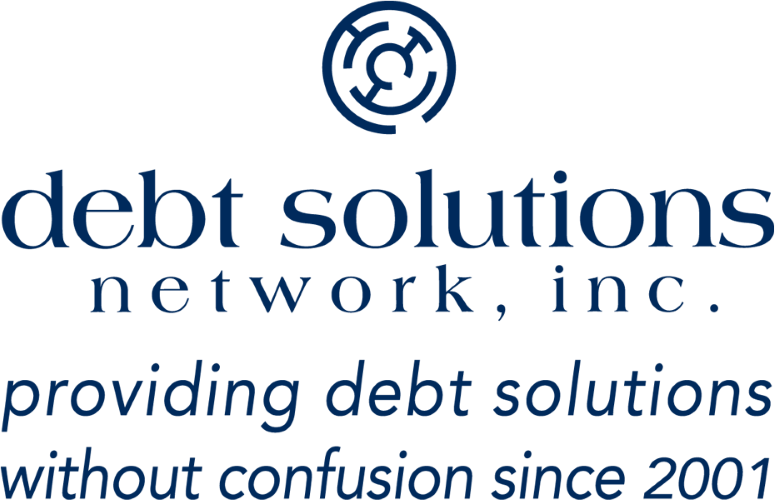 Our friendly professionals at Debt Solutions Network will work with you to determine a monthly payment that works best for you, but you ultimately decide what you will pay each month. We also act as a shield between you and your creditors, stopping them from calling you and making them call us instead. People often will shoot themselves in the foot when dealing with creditors simply because they don’t have the experience to do so. When you are paying your creditors just to barrow the money back each month, you’re stuck in a vicious circle that will be very hard to get out of on your own. This program allows you to make a smaller regular monthly deposit/payment into an escrow account that your creditors cannot touch. As the funds build up in that account, Debt Solutions Network will be in contact with your creditors and negotiate settlements with them to eliminate anywhere between 80% -30% off of what you owe on any given account. We have settled out many of our client’s accounts for 80% off or more, but you can expect us to save you about 50% off of what you owe. We have saved thousands of clients millions of Dollars off of what they’ve owed over the last 15 years. We only charge based on what we save you off of what you owe, and only after we saved it for you. You never have to pay any more than your monthly amount but any time you have extra to pay in you can finish up the program even sooner. We want to get you out of debt for as little as possible as soon as possible and we work for you, not the creditors. 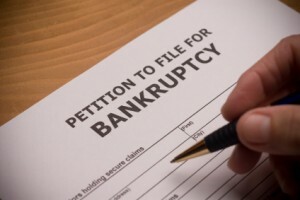 Sometimes Bankruptcy is the only choice, but since I’m not an attorney I cannot really get into whether or not bankruptcy would be right for you. If you have questions about that I would recommend contacting an attorney. What I can tell you is BK is not as bad as most people think it is. Also be careful about what attorney you end up trusting to do it, because Attorneys are their own sales people, and obviously if they can convince you to go through with BK then they’re going to get paid. Whether or not BK is your best option, they will sometimes try to find a way to convince you it is. I’ve had many a client’s try to go through BK only to find out after 6 months that they don’t qualify for or have to declare a different chapter of BK, and they end up getting screwed over. 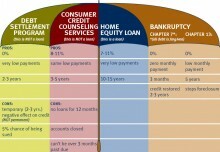 If you do qualify though, Chapter 7 Bankruptcy will most likely be the fastest and cheapest way out of debt. 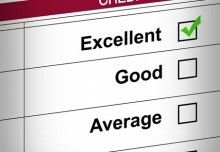 Many people often claim that Consumer Credit Counseling services is the best way to get out of debt, and for the Majority of people it probably is. 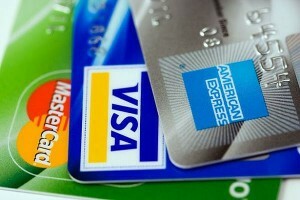 If you’re concerned about your credit it certainly is. It also can make paying them off much simpler by combining all of your monthly payments into one, possibly slightly lower monthly payment. You do end up needing to pay back all that you owe, plus interest, but at a much lower interest rate. That is also where the “savings” comes in to play with this form of debt consolidation, by getting a lower interest rate you save money off of what you would’ve paid had you kept making regular payments. Problem is if you’re struggling to make your payments each month, something will eventually come up that makes you unable to make that full monthly payment. If you miss more than one payment in a year, you will most likely be kicked out of the program and find yourself right back where you started. This program is also controlled by the creditors and credit card companies, so they are the ones deciding what you need to pay monthly, not you. It will get you out of debt faster for less if you can manage it though, and your credit could even improve because of it. Lastly some people think that Home Equity debt consolidation loan is the best way to get out of debt. It can be a successful way to eliminate high interest rates and combine all of your debts into one, hopefully lower, monthly payment. What we have noticed over the years, however, is that these do not usually help people remain debt-free. The main reason for this is that it doesn’t address one of the main causes of debt, overspending. Typically, when people use a Home Equity Loan to combine their debts they go right back to spending on the same credit cards that they just paid off. This will usually result in people putting themselves even further into debt and making their financial situation much more difficult to manage. Borrowing money to get out debt still leaves you with debt. Did this help you or do you have additional questions or concerns?